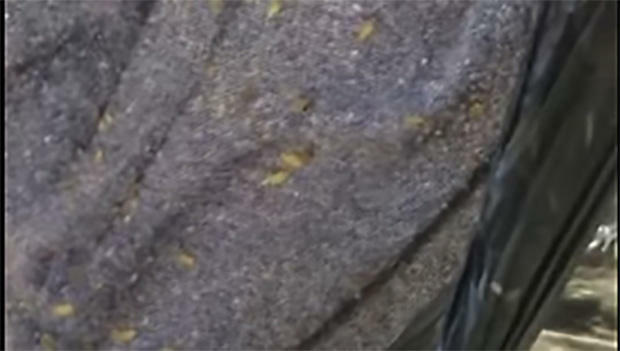 CHICAGO -- A subway passenger posted a video on YouTube showing bugs -- flat, beige bugs -- perhaps, baby bed bugs on clothing inside a bag belonging to a woman, who was sleeping on the train, according to CBS Chicago. The incident occurred Friday around 2:30 p.m. on the city’s Red Line. Michael Moore, who posted the video online, told the conductor, who then had a cleaning crew disinfect the car after it was evacuated. But what concerned Moore was the woman carrying the bag containing the bugs, waited with everyone else and reentered the train on another car. The car where the bugs were originally found was taken out of service. In September, another Red Line train was removed from service after a rider said he spotted more than 30 small, white bugs crawling around a row of six seats.